It was with very heavy hearts that we decided to let Flint slip peacefully away on 08 January 2010. Flint had been deteriorating for some time and we felt that the least we could do for all the years of joy and happiness that he had given us, was to repay him by allowing him to keep his dignity to the end. Flint was our first Siberian and was the one responsible for us ending up in a zoo, in a new country, with a new lifestyle and many stories of adventure to tell; I don't think either of us envisaged how he would change our lives those 12 long years ago when Flint first came into our lives on a cold winter's day in Peterborough, England. Over the last twelve months, as I have sat watching Flint, I have thought many times of my own fragile mortality as we have grown old together. However I have also had cause to remember so many of the happy times that have been as a direct result of having Flint in our lives. I recalled the 4 month old puppy that I chased round and round the coffee table in the lounge of our house in Breage, Cornwall (Flint was always much more mature than me). I remember having to smuggle Flint through the window of my brother's pub just outside London so that no one, including the cats, would know we had a dog on the premises. I remember those first few rig runs, struggling through the mud and up the hills of Trelowarren Estate as the seeds of addiction that became our mushing lifestyle were being sown. I can remember comforting Louise at Flint's first championship dog show in Birmingham as the obviously blind and/or stupid judge failed to give our handsome, perfect boy BIS. I can remember the joy and exhilaration of climbing mountains in Wales and the Lake District with Flint just as I can remember the pseudo-exhilaration I felt as he and Fel, attached firmly to our waists, tried to take off after sheep as we descended those same mountains. 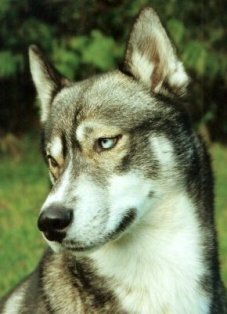 I recall mentally willing the judge at one Siberian Husky Club of Great Britain championship dog show to present Flint with the RDCC, a waste of mental effort as it turned out; but still he had come close to that prestigious honour. And I can just remember Flint always being there, a constant in our often varied and complicated lives. As our first dog Flint was also our 'alpha-dog', albeit a very reluctant one. He never had any desire to be leader of the pack, in fact I am not sure he ever had any desire to be part of the pack at all. The harness and the dog-house were not really Flint's bag, he was much more a smoking jacket and chaise longe kind of guy. With each new arrival to the kennel I swear Flint would shrug and shake his head in dismay and disbelief that we had been daft enough to bring in a new dog, a new dog that would ultimately bother, yet look up to Flint. Unfortunately for Flint, our second dog, Fel, not only adored him but also saw him as his superior in the pack. As Fel has always commanded the respect of the other dogs he unwittingly ensured that Flint remained number one to the end. As his health deteriorated Flint spent more time indoors, yet whenever he went back to his pen all the other dogs made such a fuss of him; alpha dog he may have been; dominant, aggressive and tyrannical he never was. We are so pleased that we shared so much with Flint and so sorry that he has gone; I still look for him whenever I go into his pen. Hopefully the sorrow will pass with time and we will just be left with the happy memories of the dog that changed our lives and gave us so much unconditional love and affection. Until next time old friend.